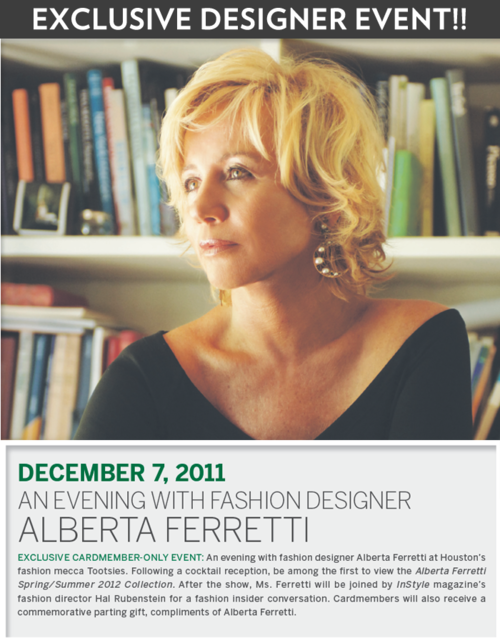 Alberta Ferretti and INSTYLE Fashion Director Hal Rubenstein will be at Tootsies next Wednesday, December 7th presenting Ferretti’s Spring/Summer 2012 Collection! I can’t wait to see the runway show and interview Alberta! Tootsies gave me 10 tickets to hand out to my most glamorous Houston girlfriends, but you too can come to the event! There are a very limited number of tickets left, so click here to purchase one for yourself! Doors open at 6pm – see you there!